Recently, I mentioned that I had crocheted a dress for the GB's baby doll, Nellie. It was fun to make. 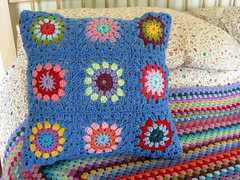 I based it on several top-down yoke-style pieces I have crocheted for the GB and other small children and babies. It's not exactly my own invention, but it required some trial and error and (oh, Lord) math to make it work well for a tiny doll. I think it worked out pretty nicely, and the GB seems thrilled with it. I have to tell you that having a little girl who loves dolls is a dream come true for me. I love dolls and always have. I'm so glad she does too. (I would be fine if she didn't love them, everyone is different, girls don't have to like dolls, my son liked dolls too. Now that we have that out of the way, I love that she loves dolls! Hee). It was easy to make. There are only three stitches in the whole thing: chains, (US) double-crochet and slip stitch. 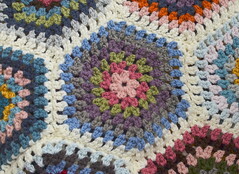 The yoke is crocheted flat to start, then crocheted in joined rounds to create the skirt. If you can do these things in crochet, you can make this dress. I've been working on writing out what I did when I made it. I tend to make a few notes before I crochet something, along with a few unintelligible jottings as I work, and then I go back and write it neatly and coherently in my project notebook. 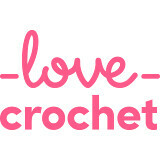 I'm happy to share my pattern but I won't make any guarantees; I'm a moderately experienced crocheter and my ideas make sense in my head and as I work, but I'm very much a fledgling "designer" of crochet patterns. The yarn is Stylecraft Special DK. From the yoke down, the colors are: Cloud Blue, Pomegranate, Spring Green, Wisteria, Shrimp, Aspen, Fondant and Aster. (We think this gives Nellie's dress a beachy look). I used a G/6 (4 mm) Clover aluminum hook. You'll also need a small button, sewing thread and needle, and a yarn needle. Row 1: Starting in 3rd chain from hook, dc in next 4 ch, sk1, ch1, dc in next 5 ch, sk1, ch1, dc in next 18 ch, sk1, ch1, dc in next 5 ch, sk 1, ch1, dc in next 4 ch, ch2 and turn. Row 2: dc in first 3 stitches, (1dc, ch1, 1dc - we'll use an asterisk to represent this sequence from now on) in ch space, 5dc, (*) in next ch sp, 17dc, (*) in next ch sp, 5dc, (*) in next ch sp, 4dc, ch2 and turn. Row 3: 4dc, (*) in next ch sp, 7dc, (*) in next ch sp, 19dc, (*) in next ch sp, 7dc, (*) in next ch sp, 5dc, ch2 and turn. Row 4: 5dc, (*) in next ch sp, 9 dc, (*) in next ch sp, 21dc, (*) in next ch sp, 9dc, (*) in next ch sp, 5dc, ch2 and turn. Row 5 (now begin making the skirt (and connecting the yoke to make "sleeves"): 6dc, (*) in next ch sp, ch6, (*) in next ch sp, 23dc, (*) in next ch sp, ch6, (*) in next ch sp, 7dc, ch2 and turn. Row 6: 7dc, (*) in next ch sp, 6dc, (*) in next ch sp, 25dc, (*) in next ch sp, 6dc, (*) in next ch sp, 8dc, ch2 and turn. Row 7: dc in each stitch from the previous row, finishing with sl st in the top of the ch2 from the previous row to join the sides, making a back seam. Continue this way, repeating Row 7 and joining ends of each round until dress reaches the desired length (try it on the doll as you work). Finishing: starting at one corner of the back opening, sl st down one side and up the other, making one or two stitches at the V where the joined rows begin (for reinforcement). Sew a small button onto on side of the back opening (I lined up my button with a place on the other side where there was a ch2 at the edge to use as a buttonhole). Weave in yarn ends. PS - Nellie is made by Corolle and is from their Mon Premier Bebe Calin line. We've had her since the GB was about a year old. She is a perfect doll for toddlers because she's easy to dress. Mommies big and small love her. You guys are really wonderful, I hope you know that. Your comments on my last few posts have been so touching and they've lifted my spirits a lot. It's going to be okay. I'll be talking about it more in the coming months, no doubt, because there will be a surgery this summer and I will probably need some moral support. But I think we're in very good hands now (I couldn't say that with confidence before the practitioner change), and that makes a very big difference. I know I'm always thanking people, but again...just thanks. We have a new podcast online if you want to listen! Just click the button near the top of my sidebar to go to the Bear's website, where we house them. This time we're talking about rituals and their importance in our lives. Coffee and tea figure heavily, along with the swamp cooler, if you can believe it. A beautiful dress, delightful colour combination. The dress is lovely, it's such a shame that Eleanor's way past dolls otherwise I'd be giving this a go myself. Glad to hear that some sort of treatment plant has been worked out, and though surgery is on the cards, it sounds as though it will be for the best. You know you'll have lots of support here. Yay! a new podcast, I've been waiting for the next one. I don't have time to listen now but I shall look forward to sitting down when I'm on my own tomorrow and enjoying it. Treatment plant? I meant plan. Just listened to your podcast, really interesting. I like to have rituals in my day, would I call them rituals or order? I'm not sure. I'm like you though, I like to unwind on an evening and don't like any kind of rituals then, apart from pouring myself a glass of wine. Nellie is adorable in her colorful, handcrafted dress. My kids had only a brief doll loving period to my dismay because I loved dolls and the pretend world I created for them. I understand your delight! What a cute little dolly dress, I just love those colourful stripes. Nellie's dress is cute and pretty, Jennifer, with your usual wonderful blending of colour. You are an artist! The dress is adorable, Nellie looks like a colorful jelly bean. I am so glad the new doctors are giving you confidence in looking after LB in the best way, and wish you well for the next step. Have a happy week, Jennifer. It's lovely, it's very satisfying creating something with your own pattern isn't it? So glad to hear that you feel you are in good hands with regard to LB's care, that must be very reassuring for you. there are many patterns online for dolls cloths & i have often come across many dolls cloths books in opshops (thrift) you might be able to get yourself some different patterns to play with as well. keep up the good work, you will be a budding designer yet! The dress turned out really well. I'm sure it was a bit frustrating to get it right! Even though I can't eat normal bread due to the gluten I found this fascinating! I had no idea you would have to adapt your baking due to high altitude.